CDC Reports: Mosquito and Tick Diseases Have Tripled! What Can You Do? Summer should be a time for outdoor play, barbecues and relaxation. But, a dark cloud hangs over our sunshine-filled days: it’s the threat of dangerous mosquitoes and ticks. The CDC (Centers for Disease Control) has reported that illnesses and diseases from these pesky insects have tripled in the United States in the last decade! While Lyme Disease is the most common, other diseases such as Powassan Virus, Alpha-Gal Syndrome, Rocky Mountain Spotted Fever, Zika and West Nile Virus are also on the rise. The experts at Giroud Tree & Lawn break down the symptoms, the reasons for the increase in diseases, and how to naturally control mosquitoes and ticks in your yard and make yourself less attractive to these bloodthirsty pests. In order to understand the differences in symptoms among these diseases we have to take a look at each one in depth. Some of them, such as Lyme Disease and West Nile Virus, are more well known. But with an influx of insects from outside the US, you should read on to learn about some you may have never heard of! When it comes to ticks, Lyme Disease is often the one we think of first. Lyme disease is transmitted by Blacklegged Ticks, or Deer Ticks, and it is usually identified by a telltale bullseye rash at the site of the tick bite. Lyme disease can cause a plethora of health problems, including fever, headache, fatigue, damage to the heart and nervous system and joint discomfort. If caught in time, Lyme can be treated with an antibiotic. However, these tiny ticks are often missed and you may not know you’ve been bitten until you start to feel the ill effects. Just like Lyme Disease, Powassan is spread by Deer Ticks. While it’s not as common as Lyme, it is a far more deadly virus! Powassan can be transmitted in as little as 15 minutes, according to the CDC. By contrast, it takes 24 hours for a tick to infect a person or pet with Lyme Disease. That’s precious little time to see the tick and remove it before becoming infected! The CDC also explains that Powassan causes encephalitis, or swelling of the brain, it kills about 10% of people who become sick, and about half of people are left with permanent neurological problems. The Lone Star Tick has been on the rise in the Northeast, and its bite can lead to a very unusual condition called Alpha-Gal Syndrome, an incurable meat allergy! A recent article in Newsweek explains that the tick picks up a molecule from farm animals and transmits it to humans through its bite. In most cases, the disease is not deadly and can be managed with a change in diet. However, severe reactions to meat can cause an anaphylactic shock and require a shot of epinephrine! Rocky Mountain Spotted Fever (RMSF) is a bacterial disease that has symptoms of a fever, headache, and rash. If caught in time, it can be treated with an antibiotic, but it can be deadly if it is missed! RMSF is carried by a variety of tick species, and in the Pennsylvania area it is typically spread by dog ticks. Zika is a virus spread by mosquitoes, and it often goes undetected. Many people experience very mild symptoms. However, the real cause for concern is that Zika can be very dangerous to pregnant women and their unborn babies. It causes a variety of birth defects and can even lead to miscarriage. Unfortunately, there is no vaccine or cure for Zika, so the only way to protect yourself is to avoid mosquito bites altogether! West Nile Virus is yet another illness with no cure or vaccine, and, like Zika, it can go undetected with just mild symptoms. However, according to the CDC, “About 1 out of 150 infected people develop a serious, sometimes fatal, illness”, and the elderly and those with compromised immune systems in particular need to protect themselves from mosquitoes. There are a lot of reasons why we are seeing an increase in insect-transmitted diseases and illnesses. Warming climate trends lead to longer insect seasons, which increases the overall population of these bugs. People are traveling more! With increased travel, throughout the United States and abroad, comes new viruses and diseases being carried to places they weren’t normally seen before. Animals and shipping materials transported from one country to another often spreads these insects. You can’t spend this summer in a bubble! So how can you safely enjoy your yard without becoming the next meal for hungry ticks and mosquitoes? 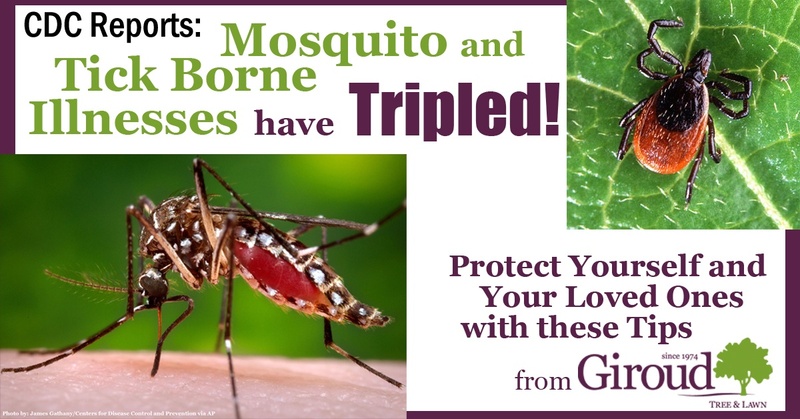 Giroud has pulled together the 10 Best Tips for Natural Mosquito and Tick Control with help from Mother Earth Living and Mind Body Green. It’s a war. But it’s a war you can win in your yard and with personal repellents. Wear light and neutral colored clothing: Mosquitoes are attracted to things that mimic nature like the colors in flowers, foliage or animals. Go for white, khaki or beige. Go Natural: Avoid perfumes or any products that contain fragrances unless, of course, you opt to wear the lovely scent of citronella. Keep Cool: Sweat and carbon dioxide from our breath are mosquito beacons. A fire also puts off carbon dioxide. Limit candles to citronella and hold off on the fire pits and bonfires until fall. Cover up: It’s tough in the summer, but when you’re out near water or woods, wear lightweight clothes with long sleeves, long pants and socks. Mosquitoes are most attracted to areas where the skin is thinner and the blood vessels are closer to the surface such as the ears, wrists, and ankles. When walking through high grasses or underbrush, tuck your pants into your socks. This will also prevent ticks from crawling up your legs. Use Repellents: Of course, DEET is the go to chemical repellent, but there are natural alternatives. Often sold in health food stores, non-toxic, botanical repellents should be reapplied about every thirty minutes to remain effective. Repellents containing soybean oil protect for about ninety minutes—comparable to DEET. When mosquitoes start landing on you again, that’s the signal to reapply your repellent. It takes an all-out assault on the parts of your yard that attract the bloodsuckers as well as creating a pest repellent barrier. Treat the Hot Spots and Perimeter of the Yard: Giroud’s Organic Mosquito and Tick Control treatments kill the pests on contact and then repel for up to three weeks. Made from essential oils including peppermint and cedar, our natural pest control is safe for children, pets, and pollinators like bees and butterflies. Prune or Remove Overgrown Vegetation: Mosquitoes and ticks are shade lovers. The Giroud Team can eliminate shady habitats in two ways. First, cleaning up and/or clearing overgrown areas. Second, pruning tree branches and shrubs around the lawn edge to let in more sunlight. Use yellow light bulbs in outdoor fixtures.They aren’t as attractive to bugs. Plant mosquito-repelling plants.These include scented geraniums, lemon thyme, marigold, tansy, citrosa plants, sweet basil and/or sassafras near your home. Watch for Danger Signs: First, you have to know you’ve been bitten. It’s very important to check yourself and your children from head to toe after time outdoors. Statistically, it’s unlikely that you will get infected by a bite. However, it still makes sense to be aware of the danger signs. Watch for symptoms like fever, joint pain, and rash. Yellow onion contains sulfur compounds that relieve bug bite itches. Slice one in half and rub the cut side on the bite. Refrigerate leftovers and make a fresh slice before reapplying. Tea tree oil is great for stings. Remove the stinger and gently apply it on the entry point. Baking soda works, too. Mix it with water to form a paste. Remove the stinger, apply the paste, and cover until the pain is gone. Concerned about ticks and mosquitoes? Your Giroud ISA Certified Arborist will be happy to do a free evaluation. CDC Reports: Mosquito and Tick Diseases Have Tripled! What Can You Do? Overall rating:	4.8 out of 5 based on 2621 reviews.